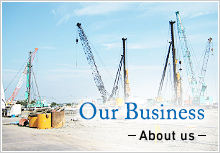 JAPAN PILE CORPORATION is a foundation construction company specializing in pile foundation. Pile foundation can be classified into three types; concrete pile, steel pipe pile and cast-in-place pile. JAPAN PILE is a “general” foundation construction company in a sense that it handles all of these three types of piles. Also, JAPAN PILE manufactures concrete piles at its own 11 factories across Japan. Experience is crucial for foundation construction as major part of the construction is executed underground and invisible from the ground level. JAPAN PILE has nearly a century-long track record of concrete pile construction across Japan, through which we have accumulated a wealth of technical data. We present optimal solutions regarding the pile type and construction method to our clients by utilizing our expertise, while taking into account cost performance. Also, our team of experienced construction administrators ensures safe and reliable foundation construction. Foundation is important base of the social infrastructure. We are continuing our efforts to contribute to the safe and secure society through our sound and reliable foundation construction. Also, in order to globally utilize our expertise in foundation construction, ASIA PILE HOLDINGS group, of which JAPAN PILE is a member, is expanding its business field to Vietnam and other Asian countries. We really appreciate your support for JAPAN PILE CORPORATION serving for the global society through our foundation construction.